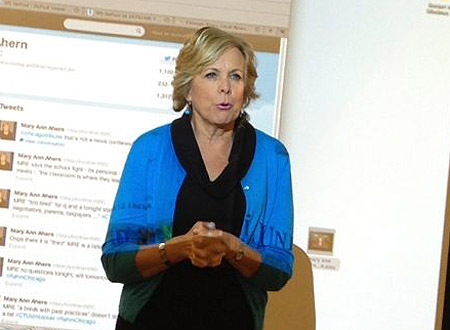 Standing your ground, sticking to your ethics and sorting through all of the political spin are just some of the challenges faced by political reporters, NBC 5 Chicago reporter Mary Ann Ahern told DePaul journalism students on Tuesday. Ahern talked about her start at a Peoria television station 30 years ago as well as her current role covering Chicago’s politics, elections and the recent Chicago Public Schools teachers strike. She also told the audience at the SPJ DePaul event how she got her big break in the industry, spoke on the delicate balance of raising a family while working a demanding job, and gave tips on how to cover sensitive topics regarding crime and politics. Ahern also gave a glimpse of life behind the scene on reporting political stories, including her infamous confrontations with Chicago Mayor Rahm Emanuel. While she spoke frankly and with a sense of humor about their meetings, she did stress to not lose control or get upset when an interviewing situation becomes tense. When covering crime stories, she did stress that information should be released with respect to those watching who may be related either directly or indirectly to the crime, even though it can be difficult. This being an election year, Ahern also gave the audience tips on dealing with opposing political sides and spin when covering stories. Prior to the talk, Ahern was one of the first to officially break the news on Twitter that the Chicago Teachers Union had ended its eight-day strike. She mentioned that she was a big fan of using social networking with reporting, but also cautioned young reporters that what is posted on Twitter should be taken carefully, as situations can be posted in real time without verification.